How much should you eat to fully take advantage of the many garlic benefits? How to avoid that nasty garlic breath? You’ll find here answers to these questions, plus a quick and delicious raw broccoli salad recipe with a dressing made from fresh garlic and Dijon mustard. 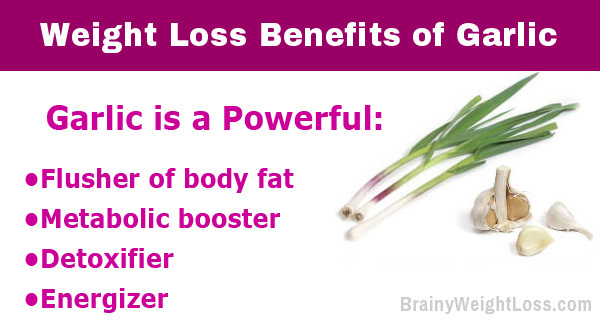 Let’s start with garlic’s weight loss benefits. regulates the ups and downs in your blood sugar levels – fluctuations that cause carbs and sweets cravings and turn on the fat-storing hormones. …garlic has been used for centuries – not only as a popular seasoning throughout Europe, Asia and Africa – but for medicinal purposes too? It’s true! Amazingly, the many health benefits of garlic are mentioned in both the Bible and Talmud; garlic was being recommended for a wide range of conditions – from coughing and parasites to poor digestion and low energy. Also, Chinese medicine has recognized its healing powers for over 3,000 years and in India, 5,000-year old Sanskrit records were found, where the health benefits of garlic were revered. Continuing this millenary tradition, recent scientific studies confirmed many important health benefits of garlic. help dissolve blood clots that lead to heart attacks and strokes. You should know that even cooked, garlic keeps your blood cholesterol from oxidizing and damaging the lining of your blood vessels, preventing the formation of vascular plaque, which contributes to the cardiovascular disease. …crush it and let it sit in the open air 10 minutes before using it. That’s because raw garlic needs to interact with the oxygen in air to form allicin, the active ingredient responsible for the garlic benefits. You can use garlic to flavor a variety of foods, including salad vinaigrettes, marinades, sauces, and pretty much all meats and vegetables. In fact, garlic is one of the negative calorie foods that you can use in many, many ways: crush, mince, chop, slice, or let the cloves whole to get varying flavor intensities from the most intense to the mildest (crushed garlic is approx. 10 times more flavorful than the sliced one). For just a delicate hint, rub a cut clove on the inside of your salad bowl before adding the main ingredients. …are due to its over 100 vital elements. The main one is allicin, which is destroyed in cooking, but other helpful compounds are formed, so cooked garlic is still healthy. However, pass up chemically processed garlic powder or garlic salt, as the healthy ingredients are long gone. Garlic also contains powerful antioxidants (vitamins A, C and E), various amino acids and priceless trace minerals (sulfur, selenium, zinc, magnesium, iron, and copper). This spice is a member of the allium family, along with onions, leeks, and scallions. There are over 300 different varieties… the most common ones are the white-skinned American garlic (the strongest flavor), the sweeter pink-skinned Italian variety, and Elephant garlic (the mildest flavor). Generally, the stronger the taste, the higher all these health benefits of garlic. Green, or baby garlic – harvested when the plant is still immature – is much milder than the mature one, and it’s best eaten fresh (like green onions) up to a few days after harvesting. Okay, Great Garlic Benefits… But the Smell!! Well, if you need to remove garlic odor after handling it, wash your hands thoroughly in cold water, and then rub them onto a stainless steel surface. Ate some garlic before a date? …reap the many garlic benefits? Not much: 1-2 medium cloves every day, or 3-4 cloves every other day. botulism toxin; prepared garlic can be safely stored in the fridge for up to a few days. 2) If you take insulin make sure you consult your doctor about consuming garlic for medicinal purposes. Or, if you aren’t particularly fond of the garlic odor and prefer to take odorless garlic capsules, they are available in most health food stores. The usual recommended dose to make the best of all the health benefits of garlic is 700-1000 mg/day. But avoid the tablets and make sure you get a high-quality, potent garlic oil obtained through cold processing, or else its benefits may be null. If you want to buy it online, I recommend Nature’s Bounty odorless garlic from Amazon because they are the highest quality, potency and value per price, by far. Plus, it comes in small, easy-to-swallow softgels with the right dosage (1000 mg) so you won’t have to take more than 1 softgel/day. 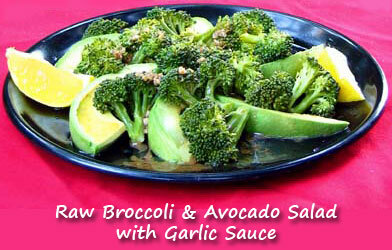 run the broccoli briefly under cold water, drain and chill in the fridge for 5 min. pour over the sauce and serve immediately. As you’ve seen, garlic is a highly versatile spice that you can easily use with almost any vegetables – especially if you’d like to try the Negative Calorie Diet Plan.